Nearly every time I’m at the beach, I’ll see a particular kind of surfer doing the hard yards…. …..I feel for them because I can sense their confusion and at times frustration. I can see it in their eyes as they watch more experienced surfers glide across wave after wave, apparently without effort. These people have generally started learning to surf later in life, often live away from the beach and have busy professional lives. Yet some part of them really wants to get good at surfing. But, at this moment, they are immersed in the beginner phase and are doubting themselves, wondering if maybe they lack the necessary ‘talent’ to get to a higher level. If you’re one of these surfers, I hope this article will help you make a break through and realise you are more ‘on track’ than you think. Hang in there! There’s no escaping the fact that learning to surf requires a good amount of effort and commitment, especially if you want to transform yourself from a whitewater warrior to a competent ‘intermediate’. In the somewhat sheltered environment of a surf lesson, you start off making steady progress, but, this is partly because your coach makes many of the critical decisions for you. They provide a suitable board and wetsuit, read the weather forecast to set the best lesson time, assess the beach upon arrival and then take you to the most suitable and safe area. As long as the instructions are of a good quality, you can expect to stand up, enjoy some long rides and when ready, paddle further out the back to where the unbroken waves are. Your coach may even paddle out with you to provide moral support and vital advice on positioning and timing as you attempt to catch your first ‘green’ waves. But the moment of truth and deciding factor on whether or not you will become a competent surfer happens after your surf lessons have been completed. This phase of learning to surf involves going through the beginner level to the point where you are successfully riding unbroken waves nearly every time you surf and generally growing addicted to the whole surfing lifestyle. Unfortunately, many would be surfers don’t make it through this phase so I thought I’d identify a few key actions that you can take to boost your progress and understand what’s to come. Tick them off and the odds are that one day soon you will feel like a surfer. 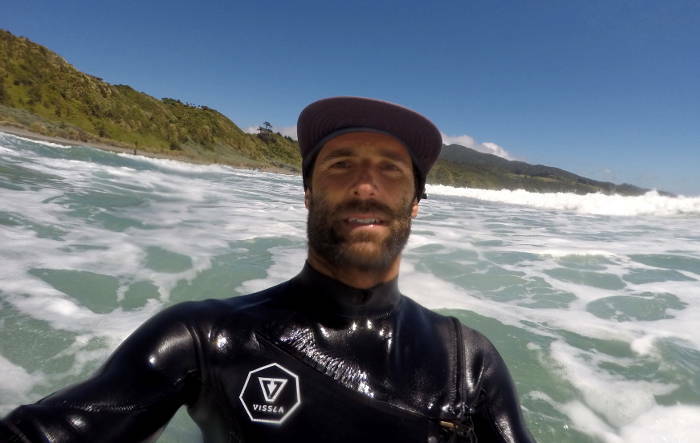 Not a newbie, but a knowledgeable surfer that can make the most of good waves at a range of surf spots in New Zealand or around the globe. Anyone that’s been on the beginner’s surf course at UP Surf Coaching will know that I outline the process of becoming a surfer on day one. I do this because many beginners do things that slow their progress or they have unrealistic expectations that lead to an unnecessary feeling of failure. A key thing to keep in mind is that when you first attempt surfing out the back as opposed to in the shore-break, your wave count will go right down and that is OK, it’s normal. Don’t be discouraged. In the whitewater you can expect to catch around 50 waves within one session and that is why the whitewater is the best place to perfect your pop up technique and stance initially. But once out the back hunting your first green waves without a coach to help you position yourself, you may only catch 1 or 2 waves in a session. Many beginners seem to feel bad about that, especially if they see other surfers catching plenty of waves. But if you’ve increased your paddle fitness, been observant and learnt about where the waves break and enjoyed even one nice ride, I’d call that a very successful surf for a novice. There is no point just driving out to the beach to see how the waves are. No good surfers do that, they always know what the weather is doing. Also, just going along when your experienced surfer friends think it’s good, is a very bad idea. You need to go when the waves are good for your level. So firstly, you need to know what type of waves are good for learning to surf (as detailed here), then you need to learn how to predict when they will occur. Any free surf forecasting website will allow you to do this for your local surf spots. If you need more info on the spots in your area, get this awesome guidebook to surfing in New Zealand. It has them all, even a few secrets they probably shouldn’t have given away! If you regularly surf the right kind of waves and slowly increase the level of challenge, you will progress much faster than if you jump in the deep end in big, steep, fast or messy waves. All they will teach you is fear, frustration and bad technique. I had my first lesson 8 years ago, then I tried myself a few times but I didn’t catch many waves, then I had another lesson 3 years ago on the Gold Coast and one last year in Bali that I really enjoyed, but each time it takes me a while to get back into it. Well, if you really want to break through to the next level of surfing, you need to keep at it steadily and give yourself a real chance. At an absolute minimum, I would suggest surfing once a fortnight at the beginning level. You could do less but you run the risk of just getting back to where you started the previous session. This is quite a defining moment and it shows you are 100% committed to learning to surf well. It probably should come before the above section because realistically, if you don’t have your own gear you are never going to get in the water enough to progress. You don’t need to spend a lot on your first board as you might outgrow it within 6 months if you surf a lot. Secondhand surfboards for beginners can be best found on Trade me, and if you keep an eye out you should be able to find something in good condition for around the $400 mark. If that is a stretch for your budget, keep in mind that beginner surfboards hold their value well. As long as you look after them you can often get around the same price when you sell. Make sure you get a board that suits you. It’s better to get something too big than too small. The construction doesn’t matter too much, it could be fibreglass (like most boards), epoxy or moulded plastic, but I would steer clear of foam boards except for the top of the range models. The cheaper foam boards flex too much and often have fins that are too small. They will hold your surfing back. It’s important to get a shape that is suitable for novice surfers. This is why I often tell people to keep an eye out for the brands NSP and TORQ. They aren’t perfect but they put out the kind of shapes you want when starting out. They come up quite often on Trade me so setup some alerts on “nsp” and “torq” or “beginner surfboard” and you’ll get an email once something comes up for sale. In New Zealand these are a must, all year round. On average, I would say surfers stay out for 1.5 – 2 hours per session, and to progress you’ll need to put in the time too. To build the momentum we talked about above, you want to be getting out there during the winter. The alternative is to be a ‘summer surfer’, but each year you’ll have to learn to surf from scratch again and re-develop the skills that have lapsed over the winter months. Realistically, 6 months of the year you will want to be in a 4/3mm thick wetsuit so that the cold isn’t even an issue. Yes, 3/2mm suits are cheaper but you will feel it come July and August. It also pays to make sure it’s sealed and isn’t the bottom of the range model. Spend around $350, look after it and you’ll get 2 or possibly 3 seasons of warmth. You’ve probably heard of some of the world class surf spots like Pipeline in Hawaii, Teahupo’o in Tahiti, Uluwatu in Bali, or J-Bay in South Africa. What you may not realise is that there are also world class beginner spots around the globe too. They make learning to surf easier and even more enjoyable. 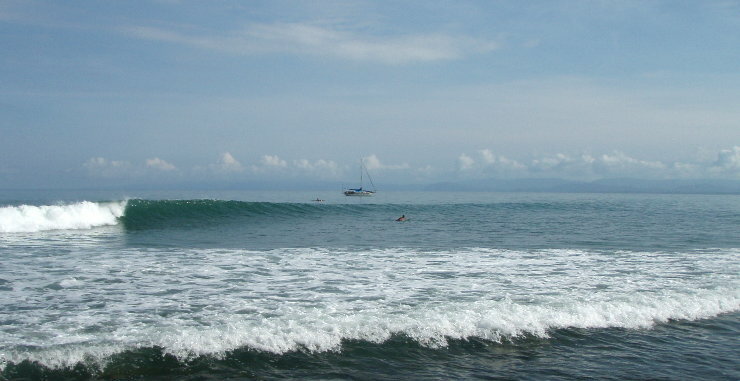 A spot that has an easy paddle out due to a channel. This means you don’t need to waste energy punching through endless whitewater waves to get out to where the green waves break. You simply paddle around the side. These type of spots are often reef breaks (don’t let that put you off, they can be 100% safe). A defined peak that is easy to read and breaks well both ways. You can then spot the waves coming easily and be in the right place every time. You have the option to go left or right and develop skill evenly on your forehand and backhand. A wave that spills rather than throws. This gives you more time to get to your feet and work on turning. It’s kind of like a slower motion wave. A wave that is long. Some spots you only have time to get up before the wave shuts down and you’re back in the whitewater. But a world class spot keeps peeling forever and allows you to practice linking toe-side and heel-side turns…it’s much more fun. A spot that is extremely consistent at a particular time of year i.e. glassy conditions and the perfect size swell day after day. You can then get familiar with the spot, build your confidence and get the repetition you need to enhance your skills. The benefit of visiting such a place, beyond the obvious stoke and good time factor, is that you will build skills that you can then use once back home. Yes, your local spot may not be as user friendly, but you might find it now seems easier than before your trip. Your wave reading may have improved, likewise your pop-up technique. A few weeks per year in a place like this can be a great way to catch up if your usual routine has only limited surf time. You could fit in 5 hours of water time per day – multiply that over a week and you will be making serious headway to the Intermediate level, where the reward/effort ratio is much more favourable. Keep at it, surf smarter not harder and you will graduate from the shore-break to the line-up. If any questions or doubts come up, flick me an email and I’ll be happy to offer advice. Just what I needed to hear man, thank you! I am slap bang in the middle of utter frustration as I seem to be taking one step forward and two steps back each time. Like you say in your piece, there are others out there who just seem to catch a wave every 5 mins like clockwork and still manage to paddle back past me to the where the best spot is like they had a fu**ing propeller under their board! Ha ha. Thanks man, I’m sticking with it through thick and thin! No surrender, no retreat. so nice! this is the information I’ve been looking for for a while! so helpful, and encouraging, thank you! Hi. I just read the article on the right time. I am a bit frustrated due to starting over again each time I get some ocean time. I don‘t live close to the ocean so my only time is holidays to improve. I would like to know if you can name some world class beginner spots. I have in mind old‘s man in Bali? Or maybe you also know some spots in Europe or Marokko to go to? Thanks in advance and really appreciate the article! Thank you for this! This is exactly the explanation and encouragement I needed! Having a total “maybe its not for me” moment, now ill go outand keep pushing! Great article! Surfing has always been a sport I wanted to do well. I failed miserably every time I tried. Coming from a competitive extreme sports background, it was very frustrating! Two years ago, I took a lesson with a brilliant coach…and I have been all in dedicated since. As a 40 yr old Mom…I didn’t have the shoulder strength from back in the day waterskiing/wakeboarding. Realizing that I would never be able to surf if I couldn’t paddle…I started hitting the pool every night! But swimming is not the same as paddling…so I got a small foamie board and use the swim bungy to latch it to the side of the pool…and paddle for 30-45 minutes. Bottom line: Surfing is the most difficult sport I’ve tried…and I am still fighting to move beyond “novice.” Thank you for taking the time to write this article and for the encouragement! There is so much good information in here all around. All aspects covered. This answers sooo many questions. Awesome article. Thank you. No worries! Everyone has to put in the effort to progress, keep at it and enjoy just being in the water, the rest is a bonus! Great article. What about beginner boards for children? My son is 8 years old and is taking whitewash perfectly on a 7′ foam board. What should I get him if he wants to go to the next level and catch green waves? How do you know when they should start using a short board? Thanks so much for this. I have found most surf instruction frustrating because I consider things in the article basic concepts and they are never taught, even in “intermediate” level lessons. As a seasoned athlete (skiier, equestrian and rower), I don’t want to pay for a “feel good” lesson; I want to learn something. I’ll def be paddling out for more, and hopefully improve! Great article. I have surfing on-off for 10 years (currently 40 years old) and live in a country with no waves, so surfing has been limited to holidays. And the frustration is exactly what i am going through for some years. Currently in Japan and had 6 sessions of which of 3 really bad, 3 good. All came to the conditions ( choppy, too big swell) and / or too small board selection. This article gave much more motivation going forward and for tomorrows session! Still riding the green wave is one of tye best feelings in a world!!! Thanks for the feedback, motivates me to add some new articles! 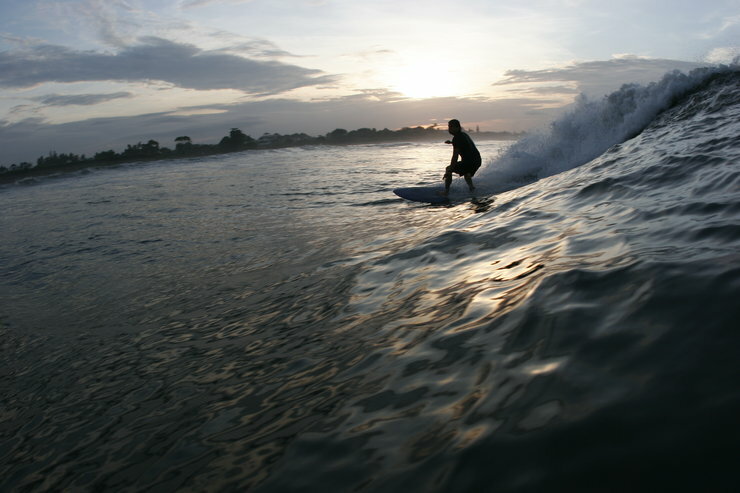 Have fun surfing in Japan, I lived and surfed in the south for a few years, amazing waves and coastline. This is SO helpful, encouraging, practical, all of it. Thank you! Thanks for the comment Tara, hope you’ve been getting some waves in. Hey mate, great article! Reading this from Tofino BC, Canada and it really hits home for a mountain/ 2 surf trips a year kinda guy like myself. Glad you found it useful Gavin, let me know if you come down our way! Hi, I’m from London, UK currently in Durban, South Africa purely to learn to catch green waves. It looks so easy and the waves are great… for other people and today just drinking a beer I’m thinking what the hell am I doing. So it was so great to read that I’m not alone and I look forward to trying again tomorrow! Yeah it always takes a while to get the green waves sorted, try not to compare yourself to others that make it look easy, they would have put in the hours to get to where they are now!